Like me, I’m sure you’re preoccupied with what to cook for Chinese New Year…the year of the pig. 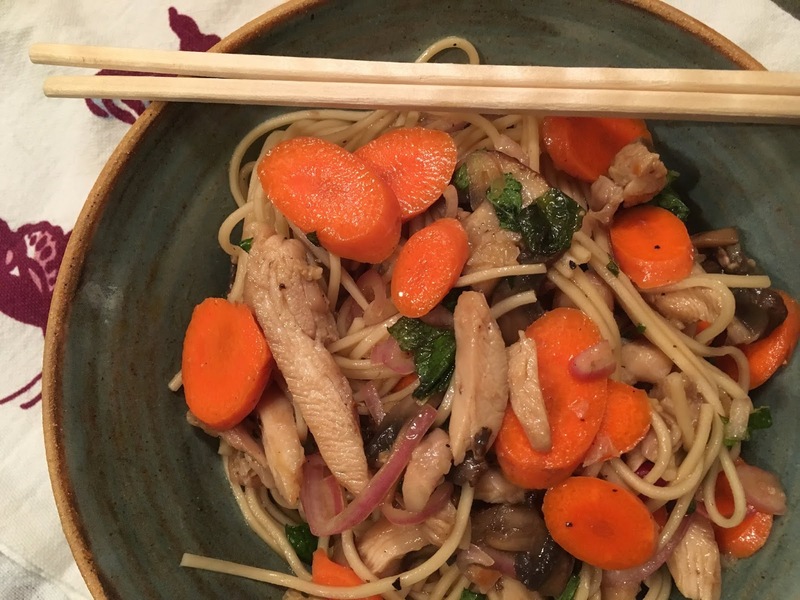 Let me tell you, there’s lots to love about this lo mein, not only is it quick and easy, but you can include pork, chicken, or just about any vegetables you happen to have in the fridge. And it’s really flavorful. For the sauce, stir together a third of a cup of fish sauce, a quarter cup of maple syrup, a splash of vegetable oil, three minced garlic cloves, a tablespoon of Sriracha, and a few shakes of salt and black pepper. If you’re including meat, slice thinly and toss with a couple of tablespoons of the sauce in a separate bowl. While you boil your lo mein noodles, or thin spaghetti, heat a large pan over high heat and cook the meat for a few of minutes until barely cooked through, then set aside. In the same pan, saute some sliced carrots, scallions, bok choy, kale, mushrooms, or any other veggies of your choice, add more vegetable oil if necessary. Once tender, scrape them into a large bowl along with the sauce, the juice of two limes, the drained noodles, and the cooked meat. Toss well, and serve with Sriracha.